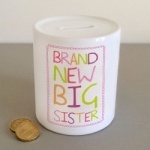 We've scoured the globe and hand picked some great and truly unusual new baby gifts. Some of them are wonderful keepsakes and others are just plain FUN! Our new Baby Journal is a lovely gift idea...and practical too! It is a handy size and great for jotting down those lovely moments in a baby's first years. There's plenty of room to jot down all those 'baby firsts' along with funny or touching moments like the things new babies do. It's great to keep while they are growing up making a note of odd things they say or words they get wrong! We've got funky first tooth boxes, birth certificate holders and even fantastic pirate and cupcake tooth fairy pillows! All of them make great new baby gifts. Thinking outside of the box will make your gift stand out and give the parents something to make them smile while the little one chews and slobbers on it! 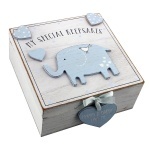 Of course we have first curl, first tooth and name bracelet keepsake box sets for boys and girls. 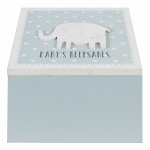 Whilst they might not be the most unusual baby gift, we think our vintage styled box set will be well received. 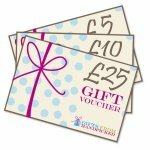 We also have a range of new, unusual baby gift cards, tags and beautiful ribbon.